Just yesterday, we spotted the OnePlus 5 on Geekbench, and the listing revealed some of the specs that we should see on the latest flagship killer. Today, the latest OnePlus handset made an appearance on GFXBench, which gives us a little more information about what to expect when the handset is unveiled on June 20th. According to GFXBench, the OnePlus 5 will be equipped with a 5.5-inch screen with a 1080 x 1920 resolution. 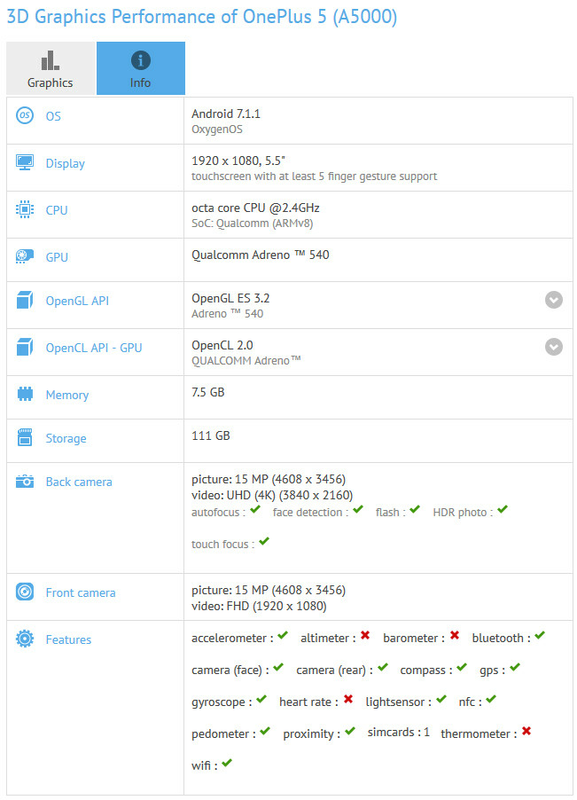 The Qualcomm 835 chipset is under the hood carrying an octa-core CPU running at 2.4GHz, and the Adreno 540 GPU. 8GB of RAM is inside along with 128GB of native storage. Both the back and front camera weigh in at 16MP and while the listing didn't show it, we expect to see a dual-camera setup on the back of the handset, with one camera shooting in monochrome for sharper images. There is talk that one of the camera sensors will weigh in at 20MP. The Android 7.1.1 version of Oxygen OS is pre-installed. While the phone will be introduced on June 20th, it is expected to be released in two countries (one of them being India) on June 22nd. Seeing single SIM this doesn't seem to be authentic! Hey i couldn't find that being specified anywhere? Where did you find that? Hope no 1080P Amoled this time one plus 1080P IPS a lot better than 1080P Amoled.